What kitchen couldn't use more storage, amIright? 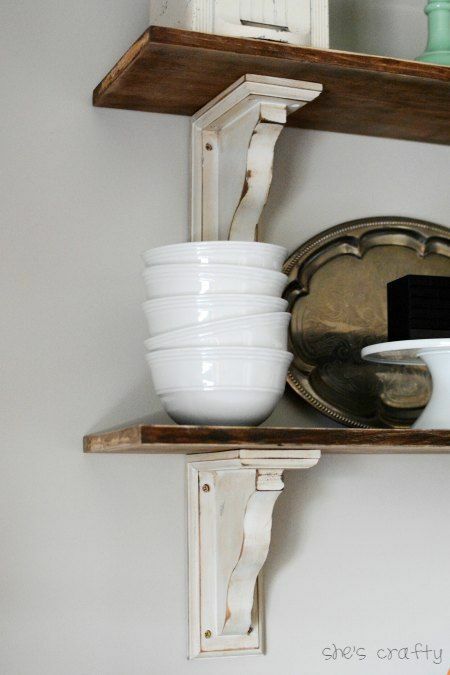 But of course we want that storage to be not only functional, but pretty to look at. 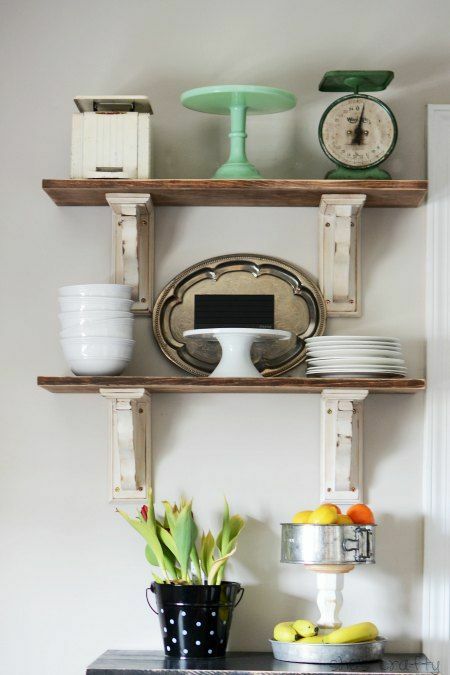 Open Shelving from Reclaimed wood fit both form and function. In our kitchen, we have a spot that is seen from all entrances that can't hold a cupboard because of the layout of our kitchen. I've experimented with several decor items and furniture pieces, but never could quite find the "right" fit! Then I cam across the shelves that Lolly Jane did, and I knew that was exactly what I wanted to do. I was able to reuse wood from another project. I left the nail holes and unfinished stain as is on the reclaimed wood, and then sanded the wood really well to age it even further. especially along the edges. Wipe the shelves to remove dust. Then brush on stain. Let that sit for just a few minutes, then wipe it off with a rag. Let dry over night. 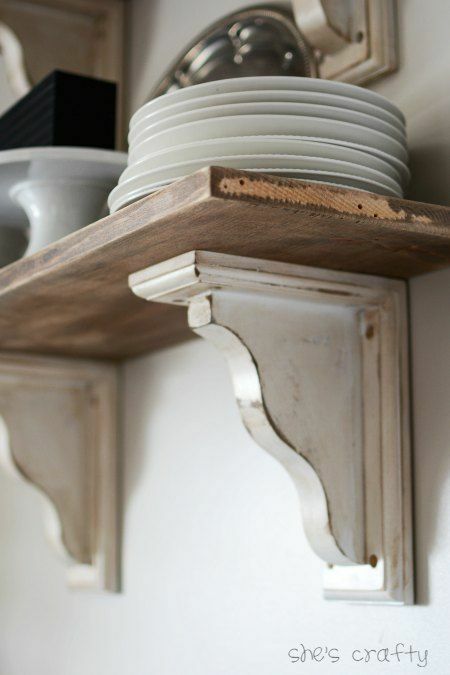 Attach the reclaimed wood to the corbels. After the shelves are built, they are ready to hang. These shelves really need to be screwed into a stud or hung with wall anchors so they can handle the weight placed on them. I'm not going to lie, hanging them was not very fun. I was home alone so just picture me standing on a chair, trying to get the shelves level as I marked where the holes needed to be. It was quite the balancing act. Luckily, I was able to get one side of the corbel screwed into a stud, so I only used wall anchors on the right side of each one. They are very sturdy! 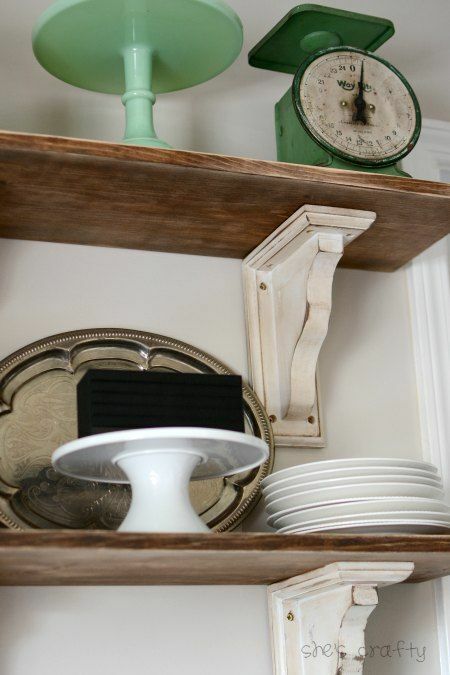 I styled the shelves with cake plates, vintage scales, a silver platter, white dishes that we use every day and my trusty blue tooth speaker (the black rectangle in the photos). I love how the shelves turned out. 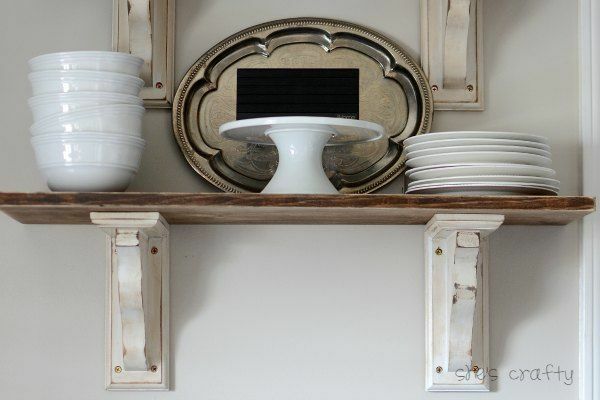 They are so much fun to style and add farmhouse charm to my kitchen! 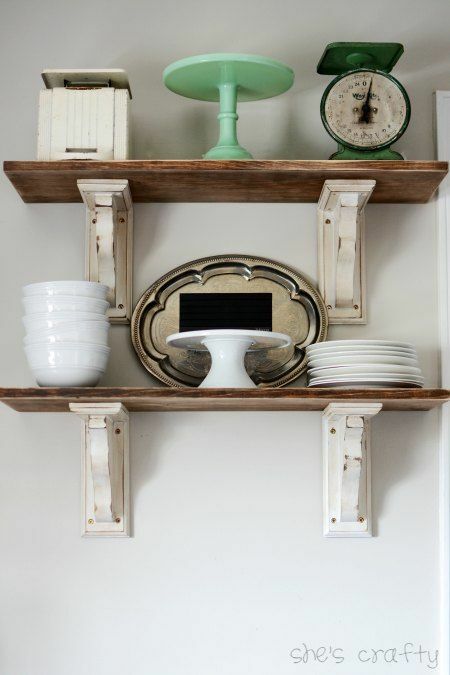 This looks so fabulous, I love the chunky corbels! Super cute, I like it! Thank you for sharing! 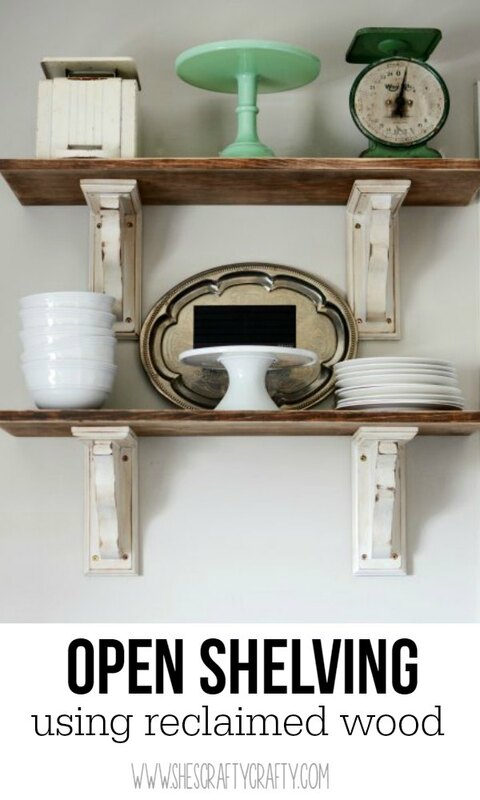 Great way to display items you love! This is gorgeous! We're currently staying at a beach house and those shelves would look amazing here! 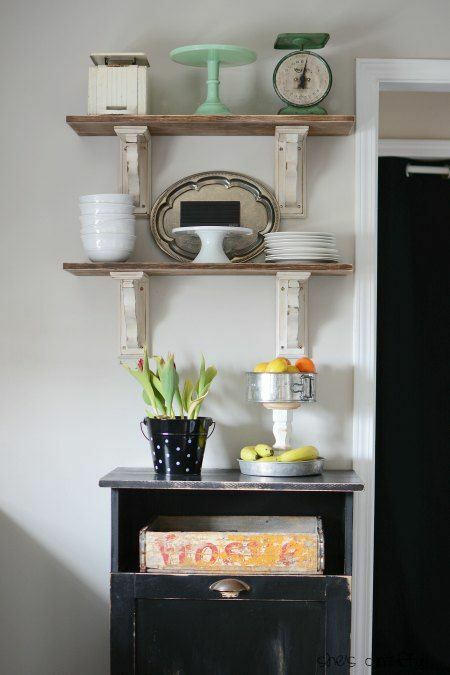 I love the rustic vibe! Thank you Marcie! A beach house sounds lovely...I hope you enjoy! It looks great! I love you accented using cake plates, super cute!